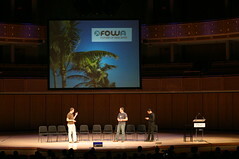 In addition to the half-day workshop I presented at FOWA Miami, I also gave a talk as part of the main event with Tantek and Brian Orberkirch (who also has a great write-up of our talk) on The Future of Social Networks. I summarized my remarks in my previous FOWA post, but I wanted to add a separate post for this talk so I could link to the slides and audio (and video should be available soon as well). FOWA was a great event, and I’m eager for the next one!